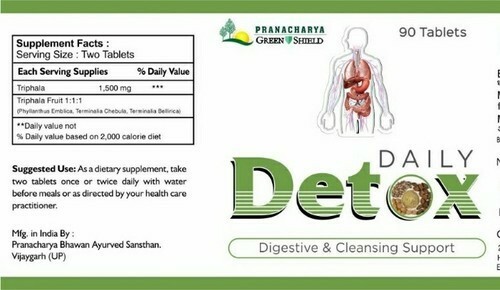 Daily detox tablets an ayurved preparation to fight against pollution and toxins in our daily life. Established in the year 2009, Greenshield Nutricare has emerged as highly prominent organization manufacturing and trading in products like Green Coffee Bean, Aloe Vera Gel, Aloe Vera Juice, Amla Juice etc. These products have huge health benefits thus, highly demanded by our customers in the market. Our experienced team members help us identify trusted vendors to source the products. Post productions these are also quality tested at our firm to ensure this purity. We make sure the products are delivered in best and safe packaging unit.